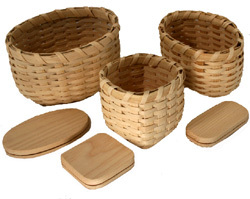 The Snack Trio Kit makes three baskets with slotted bases. Solid oak bases used are: 3x5" oval, 3" square, 2x4" rectangle. Basket sizes: Oval basket 5x7x4.5" tall. Square basket 4x4x3.75" tall. Rectangle basket 4x5.5x4" tall. These are perfect for serving nuts, crackers and chips.